Here is a cute little idea to make for cute little girls as stocking stuffers - the delightful fabric butterflies. 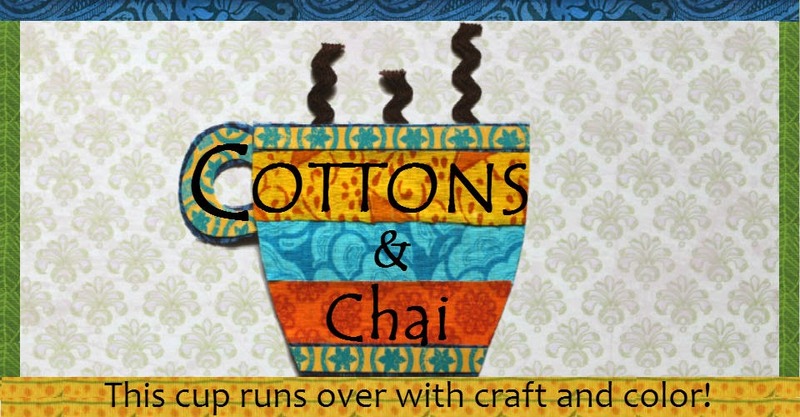 This project, much like the gifts in our previous posts of the series, requires small bits of fabric which you can easily find in your stash. 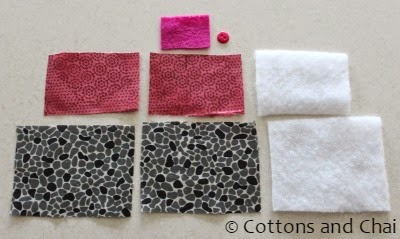 Plus it is a great way to make a variety of color combinations. 1) Two pieces of fabric 4" * 3"
2) Two pieces of fabric 3.5" * 2.5"
3) One piece of batting 4" * 3"
4) One piece of batting 3.5" * 2.5"
5) One tiny bit of felt 2" * 1"
Step 1) Place the larger piece of batting on work surface. Put the larger pieces of fabric right sides together on top of batting. 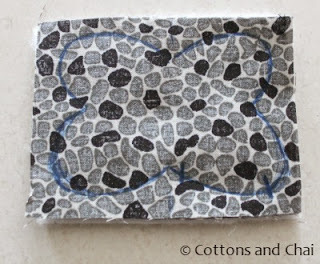 Draw the outline of a butterfly shape within the rectangle while leaving out the border for a 1/4" seam allowance. Mark two points on the outline to leave a gap open while sewing. Step 2) Similarly stack up the smaller piece of batting and fabric and mark an outline of a butterfly on it. 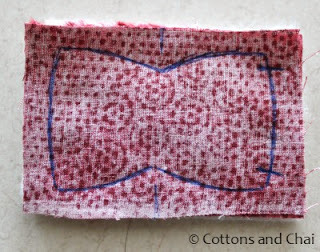 Step 3) Sew along the outline while leaving an opening open for turning. Leave a gap of 1/4" and cut all around the shape, Clip corners and cut notches along curves. Do this for both butterfly shapes. 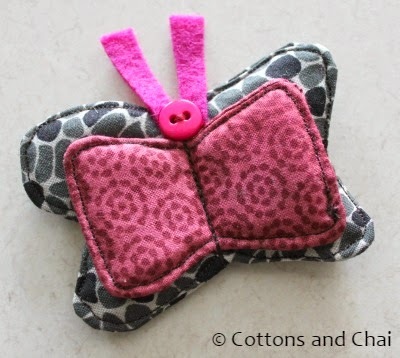 Step 4) Turn both butterfly shapes inside out and top stitch, while taking care to close off the opening. Step 5) Cut 2 little antennae from the felt piece and sew them to the top center of the larger butterfly shape like so. 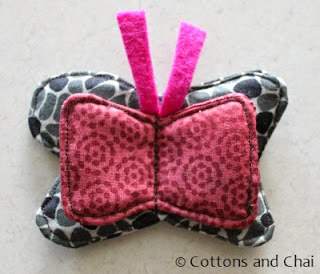 Step 6) Place the smaller butterfly piece on the larger one and attach the two by stitching a straight line in the center. 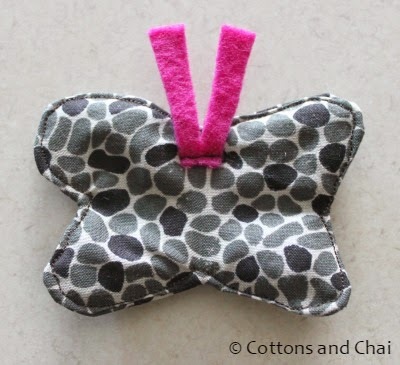 Step 7) Finally, sew the button on top of the smaller butterfly shape and voila! The adorable butterfly is done! This can now be either glue gunned on to a hairband or stitched to an elastic hair tie. 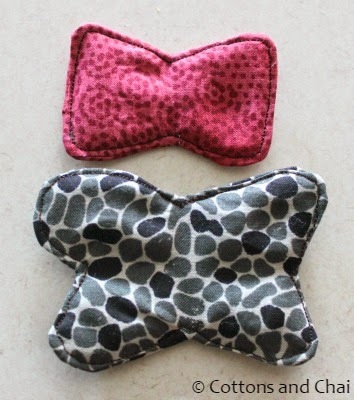 It can even be used as embellishment for T-shirts/ skirts etc. 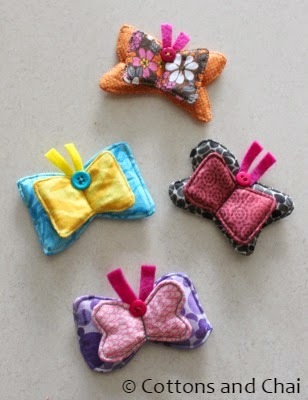 These accessories are pretty quick to whip up and soon I had a swarm of butterflies ready! So go ahead and sew these for a little girl and make her heart go all a-flutter!